The Villa has plenty of room with it's open plan, modern design. The huge living area opens onto the pool and outdoor entertainment area with magic views across the water. The Large Bedroom is beautifully decorated and has a King Bed and built in wardrobes. The stunning bathroom has a walk in shower, quality fixtures and fittings with the laundry cleverly combined. The modern kitchen has everything you could need for entertaining with quality appliances and a huge oven with gas cook top. The property is air-conditioned and has everything you could possibly need. There is parking for 1 Car in a secured carport and there is also plenty of street parking. 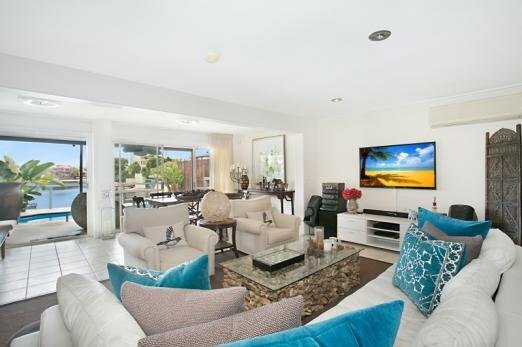 It is handy to all amenities, bus stops and light rail and is just a short 10 min stroll from the major shopping centre Pacific Fair and Jupiters Casino. Please read your final confirmation and arrival instructions from Holiday Accommodation for full access instructions.